But what does ‘freedom from’ religion actually mean? And does it mean the same to everyone using the phrase? At the Law and Religion Scholars Network (LARSN) Conference, I took the opportunity to address these questions in my paper, entitled ‘Is there a right to be ‘free from’ religion under Article 9 of the European Convention on Human Rights (ECHR)?’. The following is a summary of that paper. Article 9 of the European Convention on Human Rights protects the right to freedom of thought, conscience and religion. This right is not just important for those with a religious affiliation. The European Court of Human Rights (ECtHR) has consistently stressed that Article 9 also protects the interests of atheists, agnostics and the unconcerned. The scope of the right to freedom of thought, conscience of religion is remarkably broad. It includes inter alia the right to hold a religion or belief, to change a religion or belief and to manifest a religion or belief. In recent years, new rights -such as the right not to manifest religion or belief- have been identified and protected by the ECtHR in response to the changing nature of religion and belief in the contemporary European landscape. There are various ways to classify the different rights protected by Article 9. The traditional method is to distinguish between rights which fall within the scope of the forum internum (the internal realm of the mind) and those which fall within the scope of the forum externum (the external realm of action). An alternative way is to distinguish between positive rights (rights to do X) and negative rights (rights not to do X). Positive rights and negative rights are corresponding rights. Broadly speaking, for each positive Article 9 right, there is a correlating negative Article 9 right. For example, the right to hold a religion or belief has as its corresponding right, the right not to hold a religion or belief. Interestingly, in the literature relating to the right to freedom of thought, conscience and religion, rights ‘to do X’ are sometimes referred to as rights to be ‘free to do X’ and rights ‘not to do X’ are referred to as rights to be ‘free from X’. The right not to hold a religion or belief, therefore, often appears as the right to be free from religion or belief. Whilst the phrase ‘free from religion or belief’ is not found in the jurisprudence of ECtHR, there is much support for the existence of a right not to hold a religion or belief. The ECtHR’s statement in Buscarini v San Marino (1999) that Article 9 protects both the right to hold and not to hold a religion or belief has been reiterated in numerous Article 9 cases, most recently in Güler and Uğur v Turkey (2014). So, if the right to be ‘free from religion or belief’ is used to denote the right not to hold a religion or belief, there is a right to be free from religion or belief in Article 9 of the ECHR. However, this is no longer the only interpretation of the right to be ‘free from religion or belief’. In recent years, a number of academics, practitioners and organisations have interpreted ‘freedom from religion or belief’ radically. It is now often claimed that the right to be free from religion or belief does not only protect the negative right not to hold a religion or belief, but also the right to be free from exposure to manifestations of religion or belief by others in the public sphere. The notion that a right to be free from exposure to religion or belief in the public sphere exists is a deeply concerning development in the understanding of the right to freedom of thought, conscience and religion. This is because such a right would not be a corresponding negative right to an existing positive Article 9 right, rather, it would stand in complete contradiction to an existing Article 9 right, that is, the right to manifest religion or belief. That the right to manifest religion or belief – in worship, teaching, practice and observance in public or private – exists, could not be clearer from the jurisprudence of the ECtHR. There is however only one case in which support for a right not to be exposed to religion or belief can be identified, that is, in the case of Lautsi v Italy (2009). The ECtHR has five sections, each of which has a judicial chamber formed of 7 judges. Lautsi v Italy (2009) was heard by the Chamber of the Second Section of the ECtHR. 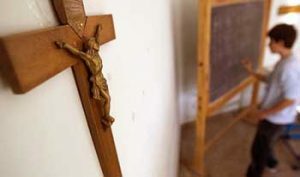 This case concerned the presence of crucifixes in public school classrooms in Italy. The applicant, Mrs Lautsi, complained that this practice was contrary to the principle of secularism according to which she wanted to raise her children (an Article 2 Protocol 1 complaint relating to the education of children) and that it infringed her right and her children’s right not to hold a religion or belief (an Article 9 complaint). The Chamber began, in an uncontroversial way, by recognising that both the ‘freedom to believe and the freedom not to believe (negative freedom)’ are protected by Article 9. Secondly, however, it then took a further step which was almost completely unsupported by earlier ECtHR jurisprudence. The Chamber expanded this negative freedom to include not only the absence of religious services and religious education but also the absence of ‘practices and symbols expressing in particular, or in general, a belief, a religion or atheism’. Moreover, in this particular case, this negative right was deemed to have more weight than the positive right to manifest religion or belief through practices or symbols. This novel interpretation of negative freedom led the Chamber to hold, unanimously, that the presence of crucifixes in public schools classrooms violated Article 2 of Protocol 1 taken with Article 9. This was an unexpected decision by the Chamber, based largely upon its new and provocative interpretation of negative freedom to include freedom from exposure to religious and non-religious practices or symbols in the educational context. This interpretation of negative freedom was, and continues to be, used by proponents of the view that there is a right to be free from exposure to manifestations of religion or belief in the public sphere. However, the decision of the Chamber in Lautsi v Italy (2009) was subjected to immense criticism at the time and commentators, both then and now, consider the reasoning in this case to be not only unsound but erroneous. Support for this view can be found in the fact that the decision of the Chamber in Lautsi v Italy (2009) was completely overturned when it was reviewed by the Grand Chamber of the ECtHR in Lautsi v Italy (2011). In early 2010 the Italian Government asked for the case of Lautsi v Italy to be referred to the Grand Chamber. The Grand Chamber is formed of 17 judges, including the President of the ECtHR. Referrals to the Grand Chamber are only accepted on an exceptional basis; that Lautsi v Italy was accepted reflects something of the controversial and high profile nature of this case. The Grand Chamber began, like the Chamber two years earlier, by recognising that Article 9 includes the ‘freedom not to belong to a religion’. However, it then departed from the reasoning in the 2009 case by focusing on the danger of indoctrination (under Article 2 of Protocol 1) rather than on negative freedom in Article 9. In fact, it implicitly rejected the notion that negative freedom included a right to be free from exposure to manifestations of religion or belief. Moreover, in the concurring opinion of Judge Power this notion was unambiguously rejected. This different approach led the Grand Chamber to hold (by 15 votes to 2) that the presence of crucifixes in classrooms had not violated Article 2 of Protocol 1 and that it was unnecessary to examine Article 9 separately. The Grand Chamber judgment is final and cannot be overturned. As such, there is no longer any support in the ECtHR jurisprudence for the existence of a negative right to be free from exposure to religion or belief in the public sphere. So, if freedom from religion or belief is interpreted in this way, then there is no right to be free from religion or belief in Article 9 of the ECHR. The right to be free from religion – in the sense of a negative right not to hold a religion or belief – is engrained in the case law of the ECtHR. However, whilst the expanded notion of ‘freedom from’ religion is becoming popular and an increasing number of academics, practitioners and organisations are claiming that the right to be free from religion also includes a right to be free from exposure to religion or belief in the public sphere, it is important to bear in mind that since the Grand Chamber’s decision in Lautsi v Italy (2011), there is no longer any support for the existence of such a right in the ECtHR case law. Given the ongoing popularity of this latter interpretation of freedom from religion or belief, however, it would be sensible to avoid using the unhelpful and ambiguous language of ‘freedom from’ altogether when discussing the right not to hold a religion or belief in Article 9.